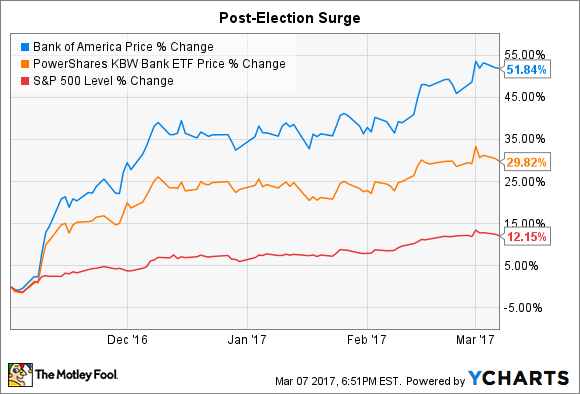 If the president can’t deliver on his campaign vows, Bank of America’s stock price could be at risk of falling. This is an unusual time for stocks, and none more so than Bank of America's (NYSE:BAC). Shares of the nation's second biggest bank by assets have climbed by more than 50% since the presidential election in November. The optimism has been fueled by hope that Trump will be able to deliver on his campaign vows to deregulate the financial services industry, cut the corporate tax rate, and accelerate economic growth with a $1 trillion Keynesian fiscal stimulus package. All of these policies would bolster profits at Bank of America, but it's looking increasingly probable that the Trump administration will come up short on these promises, not unlike how former presidents promised more than they could deliver on the campaign trail. If this happens, it seems reasonable to assume that Bank of America's stock could suffer the consequences, giving up much of its post-election surge. For long-term investors this would present a compelling opportunity to load up on Bank of America's stock. I say this for three reasons. In the first case, even though Bank of America's shares have soared over the past four months, they're far from overvalued. They currently trade for a 5% premium to book value. This is a significant improvement over a year ago, when they traded for a 40% discount to book value, but Bank of America's shares are still meaningfully cheaper than the average large-cap bank stock, which trades for a 52% premium to book value. On top of this, while the North Carolina-based bank has struggled over the past few years to generate the type of earnings that investors expect from a bank its size, it's made considerable progress on this front. Its return on tangible common equity last year was 9.54%. That's below its 12% goal, but much better than the 2.52% return on tangible common equity that Bank of America earned two years ago. Politics are the biggest risk to stocks right now. Image source: Getty Images. Finally, regardless of whether Trump can deliver on his campaign vows or not, it seems clear at this point that the Federal Reserve will raise interest rates one or more times this year. Fed Chairwoman Janet Yellen said as much in a recent speech. "[W]e currently judge that it will be appropriate to gradually increase the federal funds rate if the economic data continue to come in about as we expect," Yellen said last week in Chicago. "Indeed, at our meeting later this month, the Committee will evaluate whether employment and inflation are continuing to evolve in line with our expectations, in which case a further adjustment of the federal funds rate would likely be appropriate." Fed Vice Chairman Stanley Fischer echoed this sentiment in a separate address the same day. "If there has been a conscious effort" to boost expectations of a rate increase, "I'm about to join it," he said. "I think the advice that has been given by a large number of members of the Fed, of the FOMC [Federal Open Market Committee], is correct, and I strongly support it," Fischer continued. This bodes well for Bank of America, which will earn more money as rates climb. The increase in interest rates at the tail end of last year should already be translating into $600 million worth of additional net interest income each quarter for the bank. And if rates were to rise three times this year, as projected by the Fed, then it could see its top line expand even more. Thus, even if stocks do fall, Bank of America is positioned to see its fundamental performance continue to improve, which is an auspicious sign for current and prospective investors in the bank.